The City is at a crossroads. It needs a boost. It needs more jobs and infrastructure to see it through to the next Century. It needs better roading, sensible cycleways and be connected to the world. It’s natural beauty and ease of lifestyle need to be protected and enhanced. For six years I have lead the Council’s Economic Development Portfolio. 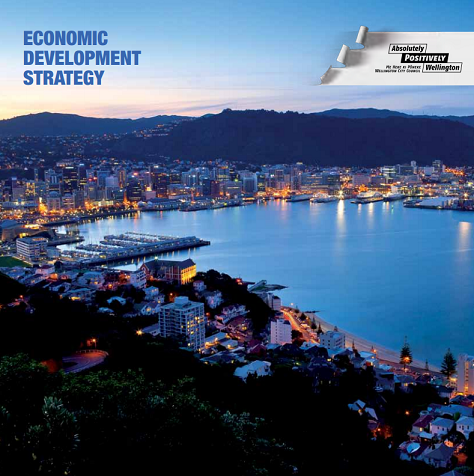 Our Economic Development Strategy of 2011 set a goal for 10,000 new jobs; focussed on attracting a long haul flight; promoted infrastructure to support tech startups and the an incubator for innovative high growth companies; promoted an investment, talent and attraction strategy; a convention centre and an open for business culture. We have laid great foundations, and we are doing some things really well – but there big projects that need to be done and I want to make that happen. My promise to you, is that as Mayor, I will get Wellington ready for the next 100 years of growth and make this city a place where future generations can thrive. I will do this with families’ front of mind - by linking in business and central government and insisting on efficiency at Council, I will keep rates as low as possible. I’ve been a busy mother managing a family, building my career and business and serving the city. The nature of Wellington helped make it work. It was easy to get around. I could nip back to the children’s kindy at lunchtime, I could watch sport after school and I always had time to pack lunches in the morning before heading down the hill to the city. But that ease of getting around is now compromised. Traffic is a problem. Frustration is rising. And I do not want to see Wellington turn into a city on edge. I want Wellington to thrive. That is why transport has become so important to me. To ensure Wellington can accommodate growth, we need to get the right infrastructure in place. We need to double-tunnel the Mt Victoria and Terrace Tunnels and have four lanes all the eay to the airport. This will allow for traffic flow and better public transport options. We need sensible cycleways to last the next 100 years. We are investigating an airport extension which links Wellington globally. We expect this of a capital city. This is whatbusinesses want. As Mayor I will consider the long term interests of Wellington not just the airlines. As an entrepreneur, I know the challenges faced when starting on your own. Wellington needs to be open for business. As Mayor I will ensure that the Council fosters a pro-business environment. Decision making will be focussed on jobs, growth and business development because a healthy economy means a healthy community. Wellington is already a fantastic ‘incubator’ for quirky and successful companies. We’ve led in food, coffee, vodka, movies, software and craft beer, while the rest of the country follows. But this needs to be taken a step further. We need to be able to export our great ideas and products directly and to attract people – employees, students, skills, stimulus and investment. We must promote Wellington nationally and internationally to attract talent and investment . Our creative and clever thinkers should be encouraged, supported and developed. Our Economic Development Strategy highlighted the need for a tech hub. Collider on Tory Street is now a busy centre for creative and innovative companies wanting to collaborate and share ideas and success. I also want to establish ‘tech field days’ which would put our high tech capability on the global map. We should be New Zealand’s digital city. Wellington can be to tech what Mystery creek is to Agriculture. We can be the Silicon Valley of the South Pacific. The city needs to better promote our advantages, opportunities and reputation in technology and film. It is by focusing on our natural abilities in fast paced industries that we will create world-class jobs for the future. As Mayor, I will give business more room to grow, will address the issues that hold it back and will strengthen global ties by promoting Wellington. Like most Wellingtonians, I am so proud of Sir Peter Jackson, Sir Richard Taylor, Weta and Park Road Post and all that has been achieved in the film industry. This is something which must remain integral to the city. Our status in the film industry will be celebrated with a film museum. A film festival to rival Toronto and Cannes would be a great addition. Let’s bring the world to Wellington. This can be supported with a concert venue. As the country’s cultural capital we shouldn’t have to fly to Auckland to see the best live shows! We need more events like WOW and international sport to attract visitors, raise our profile and link us up globally. As Mayor, building on my experience as a director for six years at Positively Wellington Tourism, I promise to tirelessly promote Wellington and its business, creative and cultural attributes to the world. One of the things I have loved about Wellington is that in this city you are able to work hard and yet step out of the office into a stunning setting. We are so lucky to be able to unwind with a swim in the harbour, a run in the town belt or a stroll on the waterfront – all of this at our front door. But more needs to be done to enhance this. As Mayor, I will ensure that our natural environment is looked after and treated as the hugely important recreational asset that it is. This means that everyone can enjoy the beautiful beaches, harbour and townbelt as part of a healthy lifestyle. Fitness is important to many Wellingtonians. We need to make sure that our sports facilities are fit-for-purpose. Pools, and sportsfields need investment as the city grows. Our aquatic space is constrained. The community can see the benefit in an additional pool at the Wellington Regional Aquatic Centre and I would love to make this happen. Wellington’s size and topography also means that it is the perfect city to aim for a ‘pest free’ status. Between the harbour and Wellington’s hills we should be protecting our birds and providing them sanctuary. Bringing back the native birds is making Wellington a more beautiful place. This is something, as Mayor, I will continue to promote. I promise that Council will deliver on a balanced, pragmatic plan to work towards a greener city with biodiversity to be proud of. If you agree Wellington is at a crossroads and that it needs to get ready for the next 100 years of growth to become a city where future generations can thrive – then join me and let’s go Wellington. Original generation time 0.6764 seconds. Cache Loaded in: 0.0380 seconds.